Use a spirit level to align all horizontal and vertical surfaces. Odd leg 'U' channels are plugged and screwed to the wall at the top and bottom of where the panels are to be fixed. Insert each panel into the bigger top channel, push the panel flush to the wall then drop into the bottom channel. Use bottom channel sections as capping to cut ends and pop rivet or screw into place as required. Odd leg 'U' channels are plugged and screwed to the soffit. Insert the panel into the bigger top channel and push the panel flush to the soffit and slide into the smaller bottom channel. Use bottom channels as capping to exposed cut ends and use pop-rivets or screws to hold capping and panels in position. Perforated metal panel facing can be cut with metal snips and a sharp knife will cut the insulation core. 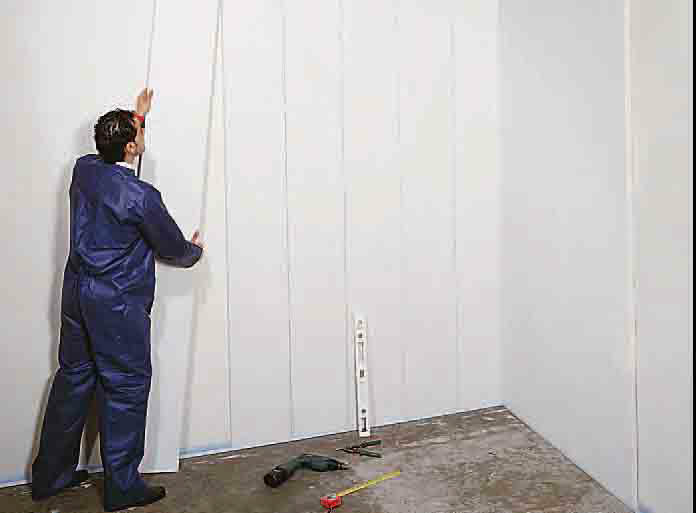 Panels can be wiped with a clean cloth.